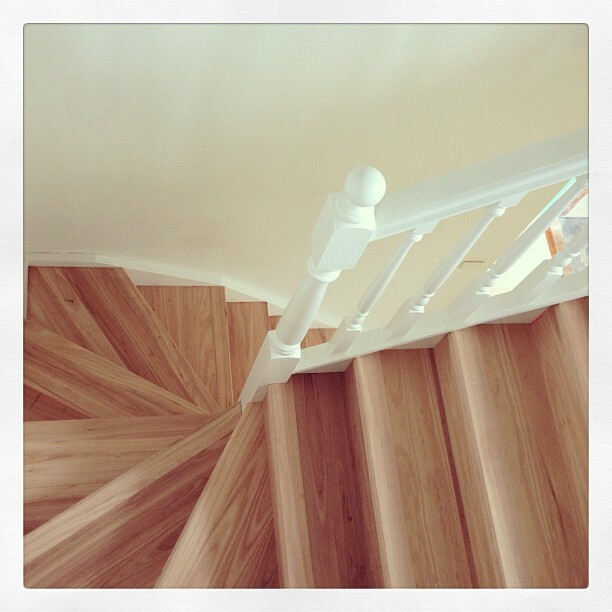 A timber Staircase matching your new timber floor, is like icing on a cake. 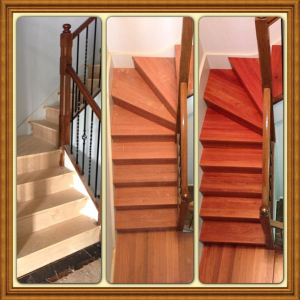 Everybody loves timber floors and if you can match your staircase then it goes without saying that the finished look will be simply stunning. Have a look at the transformation that an existing MDF staircase undergoes when the old carpet is removed to reveal the bare MDF treads and risers, right through the stages of the new solid tread and riser being installed and finally the finished product. 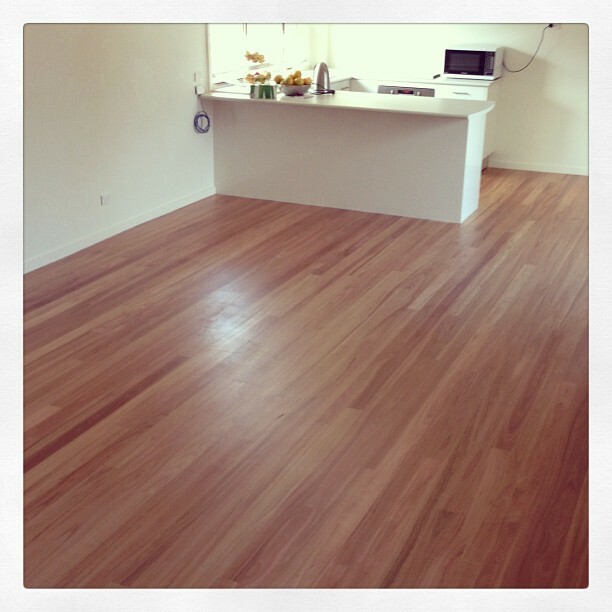 Timber Floors Pty Ltd are the family friendly choice for supply and installation of timber flooring in Sydney. Modernising your home renovation can be difficult and stressful but choosing a wooden floor provides a hassle free and stylish way to put your worries behind you. John Bruker with over 52 years experience and director of Timber Floors Pty Ltd has the enviable reputation of being at the helm of the leading company that supplies and installs timber flooring in and around Sydney. The first choice of many of Sydney’s leading designer builders for one reason Timber Floors does not compromise on quality and workmanship. A necessary process in manufacturing a Bamboo floor is called Urea, it is a type of formaldehyde used to finish many types of bamboo. Formaldehyde is a Volatile Organic Compound (VOC), which reduces indoor air quality. Bamboo floor planks are manufactured by slicing or shredding the stalk of the bamboo grass plant, and then adhering the pieces back together using heat, pressure, and a resin based adhesive. However if you do not use this process but rather heat the Bamboo you decrease the strength of the Bamboo, oftentimes making it less durable than regular wood. bamboo planks that are darker in colour are generally also softer. That is because the carbonization process used to colour the wood also weakens it structurally. Formaldehyde is all around us in many objects of daily life It’s in your clothes, furniture and curtains, walls as does your car, cigars or cigarettes. Formaldehyde is now classified as a known carcinogen, or cancer-causing agent. The bottom line is that you do not have to have it “living and breathing” with you every day of your life. Solid Australian Hardwoods are not manufactured using Formaldehyde. Not everything is coming up green for bamboo. Bamboo is only renewable if it’s properly maintained, and the fertilizers, pesticides and clear-cutting that has become more common to keep up with the demand for bamboo has made it less than an eco champion, often contaminating groundwater. There’s also the cost of transportation, as well as the cheaper bamboo that has popped up on the market, which is not only less durable but also uses more formaldehyde emitting finishes. There is no independent system that is used to rate the quality of bamboo materials. Retailers will often sort lots into grade A and grade B materials, but that is an arbitrary system and does not reflect any independent gauge as to the quality of the planks you are purchasing. Unlike, Australian Hardwoods that are stringently controlled. Forests also are being cleared to make room for the more profitable bamboo. While bamboo is good at preventing soil erosion, the initial deforestation and time it takes for the bamboo to establish itself leaves the land vulnerable. 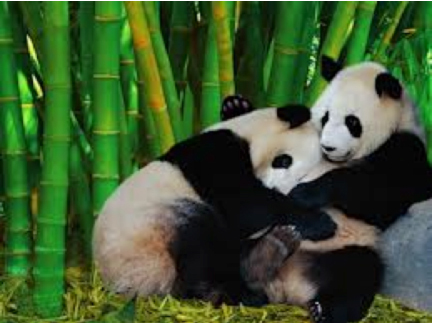 Additionally, while bamboo makes a good habitat for a large number of insects, birds and animals like the Pandas, there are other species that only call tree forests home; replacing much of the tree forests with bamboo decreases biodiversity in Asia the largest region for Bamboo sourcing. If you want a sure fire way to improve the look, durability and value of your home or commercial property, hardwood floors are the way to go. Besides being beautiful and hard-wearing, hardwood timber flooring is environmentally friendly as well. Wood is a natural resource that is both renewable and recyclabl­e. Most hardwood floors almost never need to be replaced and can add thousands of dollars to the value of a home. Hardwood floors offer an incredible array of aesthetic options, to­o. From the kind of wood, to the finish, to the design of the floor pattern, hardwood floors will suit almost any taste and circumstance. Why because timber stores carbon! Timber has a lower carbon and environmental impact than comparable building materials. Timber production is a low energy and low impact process. Timber provides simple solutions that meet regulatory requirements. Timbers used in buildings are attractive, comfortable, and high performance. Timber construction is efficient, economical, and locally supported. So how does this affect you as a new homeowner or Builder? With the introduction of the Carbon Tax fewer subjects since the introduction of GST have attracted so much attention. By choosing your floor from Timber Floors Pty Ltd you are also supporting Australian suppliers that follow Sustainable Forest Management and re-growth programs that help protect the environment in which our timber is grown. In addition when you choose Australian hardwoods you are showing a commitment to help improve and encourage conservation in Australia something that cannot be said about imported products. 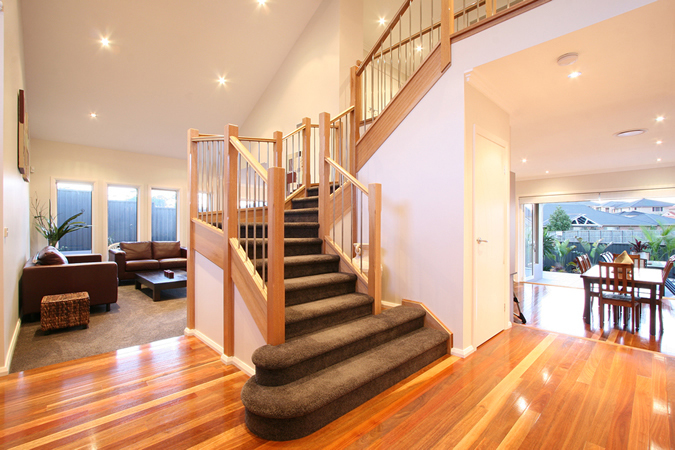 Choose the best timber flooring for your home and the most experienced timber Floor layers for supply & installation.